Our firm is instrumental in offering an exclusive range of Dry Grapes Sorting Machine Kishmish. Provided sorting machine is manufactured using supreme quality components and innovative technology. To maintain set industry standards, our quality experts test this sorting machine on different parameters. 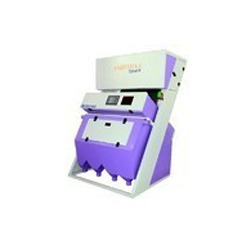 Used in varied industries, we offer this sorting machine in varied sizes and specifications as per the needs of our clients. Looking for Dry Grapes Sorting Machine ?